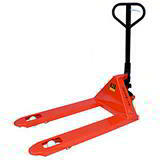 Being able to move heavy pallets quickly and safely around a busy and crowded warehouse is vital to maintain the productivity you need to help you compete. 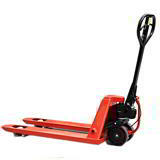 Here you'll find the means to do that and more, with a range of specialist hand pallet trucks providing all the functions you could possibly ask for. 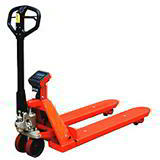 Whether it's a standard pump truck built to tackle regular loads or a low profile pallet truck designed to move smaller pallets that unexpectedly turn up, we have all the answers. 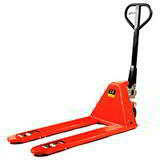 Our hand pallet trucks are strong, reliable and extremely manoeuvrable, with extra features built in to ensure operator safety at all times. 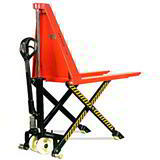 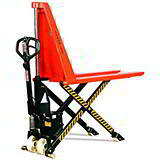 The pallet truck with service brake eliminates the possibility of a pump truck going out of control, while our high lift pallet trucks (available in manual and electric) reduce the risk of back strain by raising pallets to a height at which it can be safely and comfortably unloaded. 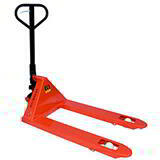 Also, our pallet truck with weighing scales is an essential warehouse accessory, doing two jobs in one to ensure pallets stay within weight guidelines when dispatching.